The wall at the ticket lobby of Union Station is lined with flags. Different flags of Canada's heritage is along the lobby wall. In this view, some of the historic architecture can be seen of Union Station. Union Station is part of downtown Toronto in Ontario, Canada. 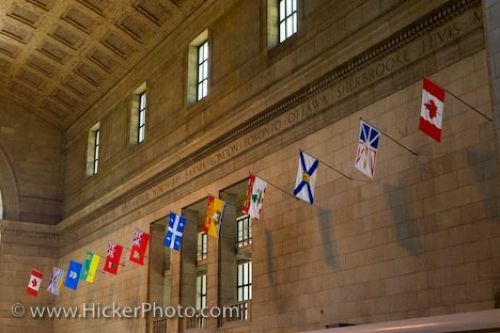 Flags lining the walls of the Ticket Lobby (Great Hall) of Union Station in downtown Toronto, Ontario, Canada. Ticket lobby at Union Station has several flags along its wall, Toronto, Ontario.